Do you love the outdoors, but hate sunburn? Do you love fresh air, but hate mosquitos? Do you love the idea of eating outdoors, but hate flies? Do you love Maryland weather, but hate Maryland weather all at the same time? If you answered yes to these questions, then you are the prime candidate for a Screened Porch. Just think – no more bugs! You can finally start enjoying your backyard. Any home improvement project of this magnitude – especially one that increases curb appeal – will help add value to your Maryland home. Because your screened porch is protected from the elements it is easy to incorporate lights, allowing you to enjoy the great outdoors well into the night without having to worry about mosquitos. It’s a dream come true! If you enjoy entertaining and you enjoy the outdoors, but hate bugs, then a screened porch is the perfect addition. A screened porch gives you plenty of additional living space, perfect for your next neighborhood barbeque or a quiet dinner with the family. Nothing is better than enjoying good company, the outdoors, and the comfort of your own home all at once. Mid- Atlantic Deck and Fence has been building custom decks and screened porches in and around Baltimore, Maryland since 1987. 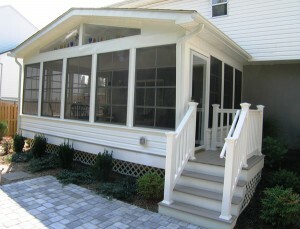 We offer a wide variety of screened rooms, from screened porches, screened pagodas or even a screened gazebo. Click Here to review some of the projects we have completed. We can make your dreams a reality! If you have any questions about Screened Porch Construction in Maryland, please contact Mid Atlantic Deck & Fence (MAD Fence) today by clicking here or calling 1-800-833-9310. You can also follow us on Facebook and Twitter as well.